To test,update and change the settings of the modules in my Joshua bus I have made a service tool in VB6. With this tool it’s possible to test all the commands (topleft datagrid),change the settings in the eeprom of the module (bottomleft datagrid) or update the software of the module with a bootloader. On the left side we have on top the communication window to monitor the Joshua bus data trafic.Below that there are some buttons for communication etc. Below that there is the command datagrid, here are all the commands that this module accepts. And in the lower left corner we have the settings that are stored in the internal eeprom of the module. In the upper right corner there are some settings for this program and below that is the datagrid with all the modules that are in use. 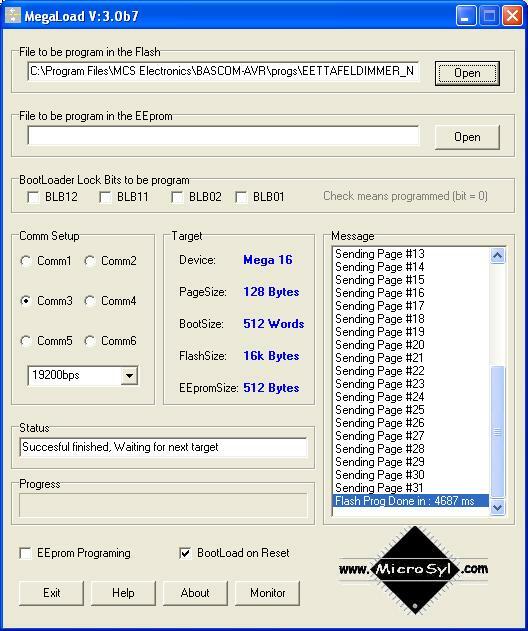 By clicking in the command datagrid on the line 199 bootloader the module wil go´s in the bootlader mode en the software will startup the bootloader loader. After 2 sec. the hex file for the module will be downloaded and ready is the update. The bootloader is not written by me, but with some register hacks completely integrated in the service tool.